Australia and the ICJ could help resolve the tensions over the South China Sea. China shouldn’t fear internationalization. Australian Prime Minister Julia Gillard used the phrase 'Yes, we will' to launch her re-election campaign. The country could also use some of the 'Yes, we will' spirit to help improve China-US and China-Vietnam relations. The United States and Australia both have strong maritime interests in the region, in terms of sea-based resources and also trying to ensure free sea lanes. But China is also a major maritime stakeholder, with ever-increasing sea-based interests commensurate with its rapid economic growth. As with many powers before it, China's growing maritime interests could overlap and even conflict with others. Yet it would be more precise to say that it’s often others’ claims that have overlapped with earlier Chinese claims. For example, in 1947, the Chinese government raised a claim over the South China Sea, a claim not made by some Association of Southeast Asian Nations states until as late as the 1970s or even 1980s. Such conflicting claims by the parties involved in disputes over the South China Sea (or elsewhere) aren’t necessarily ill-intended. But, regardless, some way needs to be found to peacefully reconcile these competing claims. For instance, China has opposed the USS George Washington's participation in drills in the Yellow Sea, a position that clashes with US interests. Such a disagreement must be settled through discussions to ensure a mutually acceptable outcome. Of course tensions between the two are about more than the naval drills. China has also argued against US access to its Exclusive Economic Zone in the South China Sea, while the United States for its part has refused to accept China’s understanding of the UN Convention on the Law of the Sea (UNCLOS). But this issue could easily be settled by seeking an authoritative interpretation of UNCLOS through the International Court of Justice. Besides, China seems to have claimed most, if not the entire, South China Sea. All parties to the dispute, including China, should therefore abide by the Declaration on the Code of Conduct in the South China Sea signed in 2002 by China and all ASEAN members, which excludes the use—or threat of the use—of force. 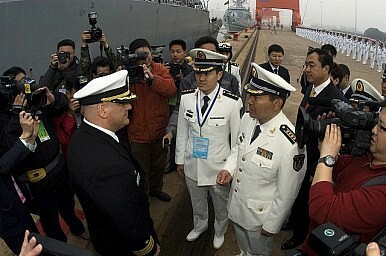 The US cares about freedom of navigation in the region and apparently believes that sooner or later China will too. But there’s some heavy historical baggage to bear on this issue. China feels uncomfortable with a dominant US Navy in its backyard, especially in the context of Taiwan—it is, after all, the US that has threatened mainland China's free access to the waters around Taiwan. China, in contrast, has never taken action to deny others access to the entire South China Sea, in particular in areas beyond its EEZ. Years of school-taught nationalism has complicated efforts to find a peaceful resolution to the South China Sea dispute. Time to try the legal route. Beating the South China Sea PhoenixUS Shines at ASEAN ForumVietnam Presses the Flesh in Asia80 Percent of Zero: China’s Phantom South China Sea ClaimsThe ASEAN Economic Community: The Force Awakens?